Here’s a long view of our home in the desert. Do you see our camp? No more putting off the laundry! The crew and I squeeze into the Perfect Tow Vehicle which is crammed with dirty clothes and our quilts. On the way we stop at the campsite of Bill and Ann, friends we met at Quartzsite last year and who took us kayaking on the Williamson River last September. We received an email from Ann inviting us to stop by their campsite on the Darby Well Road. More canine pals for the crew! Sammy the beagle and Julie the dachshund come trotting out to say hello to their old pals, Bridget and Spike. After a brief visit, the crew and I motor on into town to the Ajo laundromat. After five washer loads of laundry are washed, dried, folded, and put back into the PTV, the crew and I are ready to enjoy the sunshine at our camp home. Again, a short time before sunset, I make a campfire. We make ourselves comfortable in anticipation of the light show in the sky. Today is a stay-at-home day. I clean and tidy up the inside of the BLT. I fill up the bird feeder to keep up with the increased demand brought about by a flock of eight doves and many, many purple finches. A gila woodpecker climbs up the birdfeeder post and gets his share, too. That’s the extent of my productivity . . .
. . .unless you count more wood gathering. I pay my bills online, then sit in the sun reading. The crew and I go on a little adventure, investigating the washes that wind around between our campsite and the Ajo copper mine. I think this is a perfect way to spend an afternoon. The crew seems to agree! 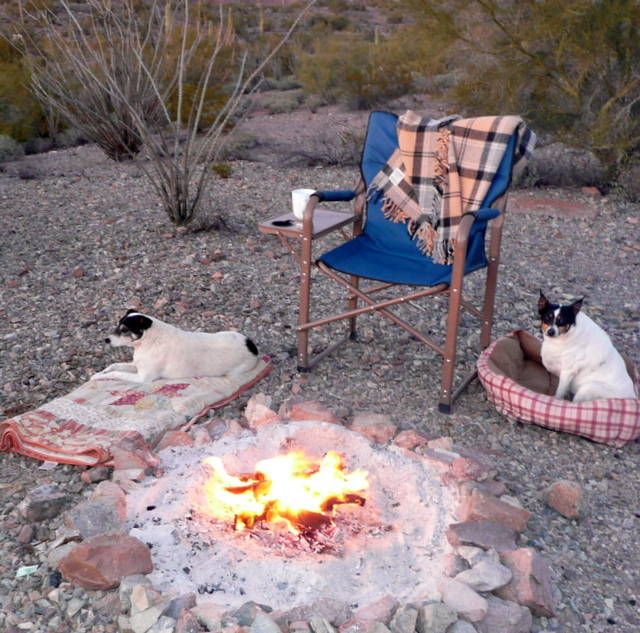 Bridget and Spike wear themselves out on our little hike, climbing in and out of washes, up and down rocky slopes. Upon reaching home they head straight for the water dish. After a bit of confusion over who gets to nap in the canine condo, exhaustion takes over. Bridget curls up in the outdoor dog bed and immediately sinks into deep slumber. And, once again, Spike gets his way, but, gee, isn’t he precious? 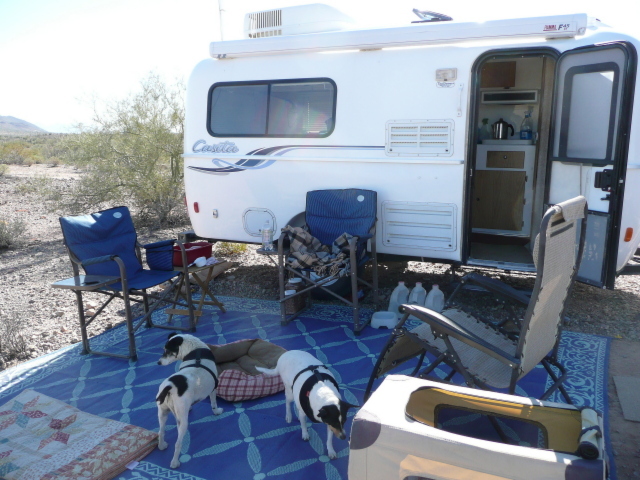 This entry was posted in Simple living and tagged Ajo, boondocking, cactus, canines, casita, desert, RVing, Sonoran, sunset. Bookmark the permalink. Just perfect…………….what more can I say!! Sue I’m always impressed by your ability to make an ordinary day exciting to read about. Sunset photos are great! I’m more relaxed and calm just reading your blog. What a nice day. Glad you are having a good green desert stay. I am about ready to find my spot in the desert. I can only take RV parks for so long then I need to find some space. They both are precious…..got to love the kids. Delightful writing and photos, as always. I so appreciate how faithful you are to you blog. You give me something fun to look forward to after a long day. You are in such a beautiful, peaceful place. Ahhhhh….keep on sharing! Beverly K from FL and WI. Beautiful !!! Love the doggie photos !! They sure like that bed. I think dogs like to be surrounded by something like a freshly dug cave in the side of a wash. Nap times in these special places gives them a feeling of security. I betcha Bridge would love her own little Condo. Take a towel and throw it over the top and cover some of the sides that would do it. Comfy and secure. Then watch the expression on her face as she says, “Gee thanks Ma”. You are so correct! We do this for our Jack Russell at times and she loves it! This is why the crew insists on sleeping under the covers when inside the BLT. I’ve been curious if you seem many snake, scorpions, and/or tarantulas? You know, poisonous thingies. The snakes are underground this time of year. If a snake were to appear, it would probably be very sluggish. I haven’t seen any snakes or scorpions here, this winter or last winter. I’ve seen two tarantulas, one in NM and the other in CA. Actually the wildlife and I are getting along pretty well… no stings so far! Always good to keep an eye out for them, just in case. Sunny spots in cooler times, etc. Neat rocky places to hide spots, etc. Not to freak you out, most want be out & should be more sluggish as you mentioned. No Always for much in Life, always an exception or variable. 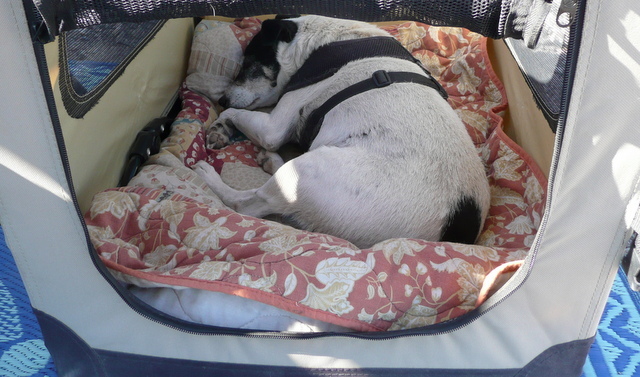 Now this is the way to spend a day-pure enjoyment…..except for laundry of course but even that can be relaxing sometimes. The crew are such little heart stealers, ya gotta love em! What a day! Your campsite looks SO inviting, wish I was there……. Aren’t dogs the best !!!! Having had dog pals in pairs for many years, I keep wondering why you don’t get another dog condo. However, you must keep in mind that my mentality for keeping the peace is as follows: I found my two guys ccnstantly “fighting” over one favorite toy (they have plenty of toys – did I mention that my dogs are spoiled rotten?! ), so I bought 2 more of their favorite toy, being positive that having their favorite toy in triplicate would make peace at home. You can predict the outcome – they still want the one toy that the other one has. Doesn’t matter that there are two more identical to that toy! By the way, I’m working/saving for the day when I can join your lifestyle. Have family obligations right now, but one day, I will be out there with you! I edited my comment at least a thousand times – didn’t catch “ccnstantly” mispelling!!! I have a fantasy romance with sitting under an awning, perfect, cozy. Your awning isn’t out. Is there some technical reason for that which I can learn from? I’ll answer for Sue from my point of view. The ‘technical’ reason for not putting out an awning is wind and sun. In the desert you can experience very strong wind unexpectedly. In the winter it is nice to sit in the sun where it is warm rather than in the shade where it is cold. I’m languishing in your “ordinary” days since mine right now consists of blowing snow and single digit temps. But from your description I can picture myself sittng outside the Casita in the sun, reading and just basking in the warmth of the sun. As always, thanks for sharing. Hi Sue! I too love reading your blog…..plan on being out there soon…….and had a few questions. 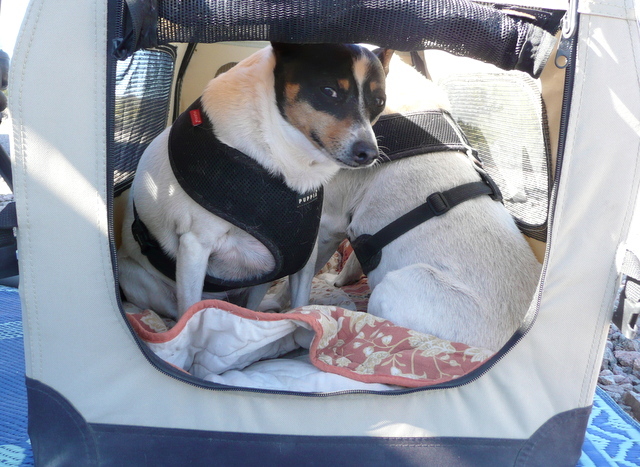 I will also be traveling, for the most part, with two small dogs. Just wondering if you ever worried about leaving your trailer while you go to town or about not being able to get to the driver’s seat without going outside. I am not a worry wort for the most part but just wondering about these issues from your perspective. I have traveled a great deal…..48 of the 50 states……but always stayed in motels. Soon, I want to take my “house” and go back to some favorite places and find some new ones. Take care and give the kids a pat from us. I don’t worry when I leave my trailer. I’ve camped in many different places and I’ve never had a problem. If I had a Class C and went into town, I’d wonder if someone would see my patio mat, camp chairs, etc. and think I’d left them behind and they’re free for the taking. You’re wondering about issues that don’t exist. I’ve never hesitated to get out the PTV or out of the BLT. Besides, you HAVE to get out of your vehicle for many reasons . . . to check your tires or an unusual sound, to pump gas, to set up camp, to enjoy your life! I hear about women buying a rig so they don’t have to step outside. Huh? What’s the point of living in an RV if you’re afraid to step outside? Like I said, being able to get to the driver’s seat without going outside is a non-issue. Fear is not the only reason for making that choice. I do so much of my travel in the winter and have been caught in so much bad weather (read: snow). I’ve reached the age… ahem… of numerous bathroom stops, and I prefer to use mine, not public facilities. I like being able to pull over and leave it running while I run to the back. But I also like the option of being able to just start the engine and drive away if things don’t seem “right.” I spent 30+ years in the Washington DC area, and security is something that becomes a part of your personality. I’m not timid, but I am aware of possible problems. People need to find their own comfort zone. My reply was based on my own lifestyle in which I don’t drive in bad weather and I don’t camp in bad places. I assume you like to keep the engine running because of bad weather. All the reasons you state are eliminated when a person camps only in good places and only drives in good weather. You’re right. Everyone needs to find their comfort zone. And sometimes the comfort zone needs to be expanded in order to live a life of adventure. I try to help women put this “stepping outside” issue into perspective. I think women tend to think Classes A, B, or C are their only options because they anticipate encountering bad weather/situations. Then they may end up with a rig that’s not right for them. In short, I say to wannabes, if you buy a Class A, B, C, don’t expect to live like I do. There’s going to be a compromise in mobility. Thanks for the reply. I’m not really all that afraid to step “outside the box”…so to speak. Just ask my friends! LOL! Been doing it all my life. Just figured it would be a good thing to be able to drive off if I see/hear something I don’t like during the night. 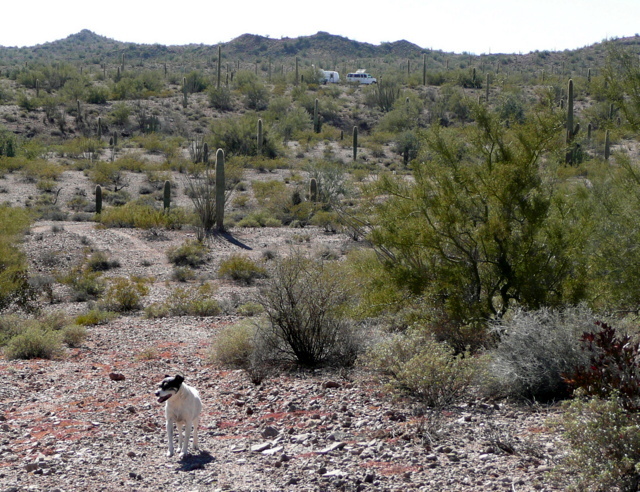 Bella, Bobby and I plan on exploring/hiking a LOT…..so don’t worry that one of your followers is a fradycat! LOL! I’ve traveled a lot…just never camped. I am trying to decide what is the best home for my guys and me. Because when I go…….it will be my fulltime home. Again….thanks so much for to feedback. You brought up some very good points. Thanks again! BTW, when I answer a reply I include opinion and information to all readers. Didn’t mean to make you seem timid. Oh, I get it about saving gas. I didn’t think about that. Probably a Class B allows you to live closest to how I do in a travel trailer. (Not that everyone wants to live like I do.) Wannabes should know that if you have a Class A or C (without another vehicle pulled behind), you won’t be able to go to all the places I’ve shown in my blog. I want to make sure readers realize that. I question whether it’s just as easy to pop off to the grocery in a Class C…. owners of Class Cs have told me otherwise. When you have a tow vehicle, you don’t have to make sure the hookups are unplugged, that the dishes won’t crash, that the laptop won’t fall to the floor, that the drawers won’t fly open, that everything on the table won’t roll off, etc. You get in the vehicle and leave. Two points of view…. both valid! Thanks for following up on this, Connie. I ‘pop off’ to the grocery store every week in my Class C and can be ready to go in less than 5 minutes. Don’t find it to be inconvenient in any way. Having said that you must recognize that I live a totally different style of life than does RvSue. Yes . . . I hope I didn’t sound critical of Class Cs. They’re perfect for some, not for others, like travel trailers. I have this persistent fear that someone who reads my blog will sell out, buy a Class C, and then be disappointed when they can’t drive to Upper Kent Lake or camp alongside the North Fork of the Virgin River or whatever I did with the BLT. Like you said, it’s a different style of life than mine. Rig choice is very important. You can pop off to the store because you aren’t a slob like I am. It would take me an hour to secure the clutter! Sue, so happy for you that you have found your way back to your “Ajo ” home! Here in Phoenix we had a beautiful day yesterday and I couldn’t help thinking of you. I imagined you sitting outside in the sun and savoring the warmth. Ahhhhh! Off topic but wanted to thank you for your posts last year about Fortuna Pond. Just off a three day river trip and wish I could stay here longer. It is beautiful! You’re welcome, John. Sounds like you know how to enjoy life! Sounds like a retired kind of life! Poor Bridget, she needs to learn to stand her ground like a woman! But it did look like Spike was all ready passed out while she stood next to him. Funny dogs! I love your panarama of the sunset with the saguaro…beautiful! I have so enjoyed reading about your adventures in the desert and beyond. I have a great list of boon docking sites thanks to you. As of yesterday I’m the proud owner of a little older 16 foot Nash and I already have my tow vehicle. Soon and very soon I’m off to the land of sun and fun.I have my Jetpack (3g/4g internet) thanks to Wheelingit. I’m good to go! And excited as a kid at christmas. I have been dreaming of this for many years and thought that was all it was ever going to be,but look at me now. There is a lot I don’t know about travel trailers,but that’s why God gave us a mind and Google. LOL I’m sure I will have a ton of questions and my first is what is the purpose of the cone on the tongue jack? I remember on our boat and such we just cranked it down onto a piece of wood. When are you going to get your amazon site up I’m drooling to get my benchmarks:) You can email me if there is some way I can say you told me and you get credit. Laurie! Congratulations! I am so very happy for you! And yes, take a look at you now! I can tell you’ve done your homework and you’ve got a can-do, will-learn attitude which will serve your well. The cone’s purpose is simple. A piece of wood would work, but the cone shortens the distance the support post has to be cranked. If the ground slopes to the front, you might not be able to lift the front end of the trailer high enough (without the cone) in order to make your home level. Casitas (and maybe Nashes, too) come with a wheel to put there instead of a cone. I don’t like the wheel because it’s heavy. I’ll try to post a link for the Benchmark maps. Thanks for your patience, Laurie. Laurie…. To order the Benchmarks… Go to my June 7, 2012 blog post, scroll down and in the text of the blog, there is a link (below the photo of the maps). That link works and right now I’m having trouble putting one here. Sorry for the inconvenience. I appreciate you shopping Amazon through my blog! An easy way to get to the June 7, 2012, post is to search “Benchmark maps.” from my blog’s search box on the right side of this page. So when I click on an amazon link through your site it will be your amazon page? Yes…. I guess I won’t know for sure until you try it. Someone bought a vacuum cleaner through my blog somehow…. Made me happy to see $16 bucks go into my bank account! So thanks to whomever did that! Ok I did it and got 4 maps. Let me know if it works because there is more stuff I want and I will just click on the benchmark page and order from there the different things I want. 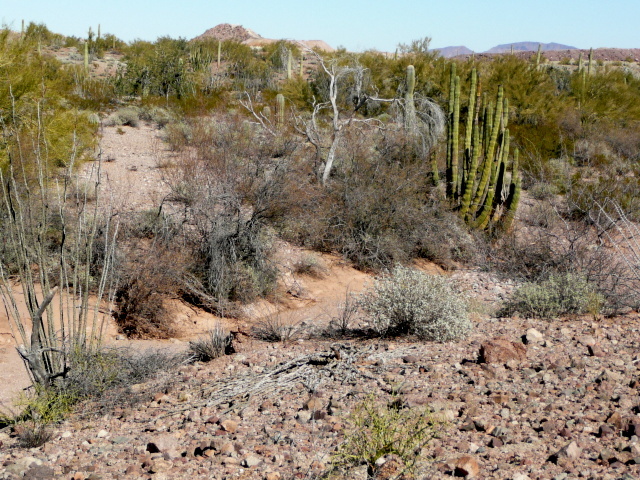 It is so beautiful here in Ajo, so peaceful. It is the first time in a year of hosting and traveling that we really feel retired. A dove was drinking out of the hummingird feeder this morning! So fun to watch the birds. I’m excited for you, Janet! My reward for the work I put into this blog is a comment like you wrote me…. Hang in there! The 3 years will pass and your new life will be that much sweeter. Spike looks pooped! Funny guy! BLT and your site looks cozy. 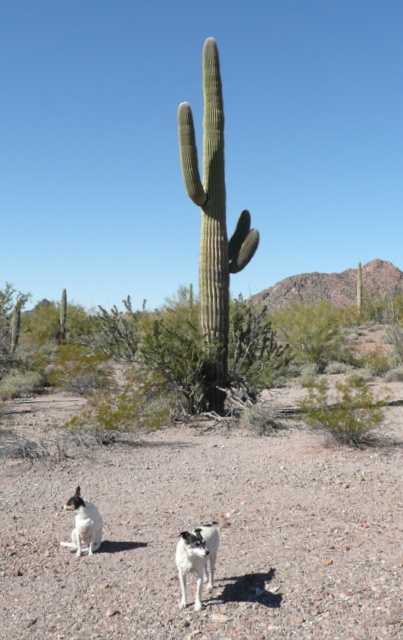 Love the pics….finally a Saguaro with arms! Here Yee…Here Yee…for all RV Sue wanta bee’s please go to cheaprvliving.com for information on how you can do it too. The site lays it all out for you. Every thought, every worry..every whim is there for you to read and some pictures too. Forget about spending tons of money on books from the experts, this site has everything you need to know and it is all FREE. So there’s no point in wannabes reading my blog, Joe? Heck I didn’t mean it like it sounds…I ah just meant this site as a helper site for those that are new to RVing. No site could ever take the place of RV Sue and her canine crew. You’re okay with me, Joe! Any other site is just that …..any other site. This blog has character, inspiration, knowledge and is fun. It’s an “ask RVSue” because she’s been there done that and doesn’t mind questions from those who are interested in her life, travels or experience. What a nice thing to say. I choked up on that second sentence. Thank you. No…thank you! I much rather be boondocking near you in AZ. Instead we are getting ready for 2ft of lake effect snow combined with -35…yes that was minus..degrees tonight. Argh! Have you ever boondocked at Apache Junction? Just wondering how that town is. Don’t forget your package…..the next time you go to town. No need to make a special trip….nothing time sensitive. Even if you remove the negative sign, it’s still too cold! Sue, I know my comment is a day late…. sounds like instead of a condo for the dogs, you need a doublewide. Ha Ha. I have 2 myself. One dominates, so if there are two toys, she has them both. They are night and day different. At night, one is right by my side, while the other patrols the house, looking out every window for any sign of movement. Even when handing out dog bones, there is a pecking order that is strictly followed. I’ll add more items as time goes by. Your suggestions are welcome. I’ll try to add the suggestions already made on the former Resources page if the products are available on Amazon. 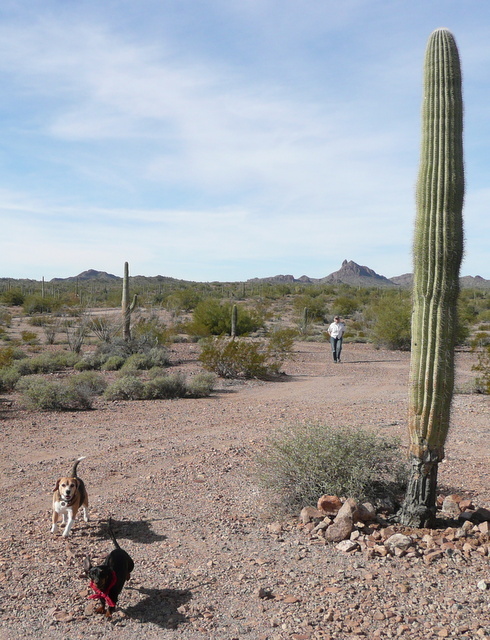 Believe it or not, my wife and I are headed for Ajo tomorrow morning for a few days break. We’ll be staying at Belly Acres. Maybe we’ll see you in town! It’s easy to spot the PTV in a parking lot, so come by and say hello!